The most wonderful coconut cake in the world, our Cooked Coconut Smith Island Cake just melts in your mouth! 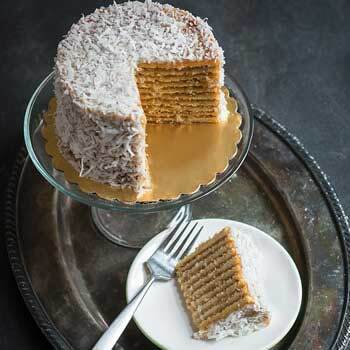 It features layers of moist coconut cake, an amazing cooked coconut icing, and is covered in coconut shavings. The cake is approx. 6" in diameter, 3.5" tall, and yields 7-9 slices. Like all SIBC products, it is shipped frozen with dry ice in a gorgeous, recyclable box.